This morning on “LIVE with Kelly and Michael,” Kelly Ripa and Michael Strahan hosted “LIVE’s Best Halloween Show Ever: Nightmare on 67th Street,” the latest installment of the show’s mega-popular Halloween franchise. Photo by: David Russell, Disney/ABC Home Entertainment and TV Distribution. New York, NY - October 30, 2015 - This morning on “LIVE with Kelly and Michael,” Kelly Ripa and Michael Strahan hosted “LIVE’s Best Halloween Show Ever: Nightmare on 67th Street,” the latest installment of the show’s mega-popular Halloween franchise. No “LIVE” Halloween would be complete without the show’s annual Costume Contest when the studio audience members always wow with their elaborate and over-the-top creations. 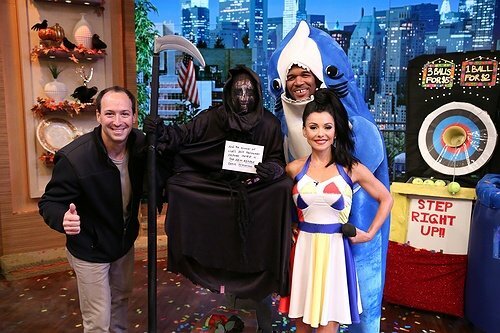 This year’s winner was 11 year old Mount Sinai, NY native Jamie Salmonson for her incredible Grim Reaper costume, who is pictured with her dad Eric and Kelly (dressed as Katy Perry) and Michael (Left Shark). The lucky Long Islander walks away with the grand prize of $10,000. The Minstrel Players Present Tim Kelly's The Butler Did It! Subject: LongIsland.com - Your Name sent you Article details of "11-Year Old Girl from Long Island Wins on "LIVE with Kelly and Michael" Halloween Show"